* Note that the High School students will take 3 exams at the end of this class. The AP Computer Science Principles Exam, given as a regular AP Exam. The other 2 exams were created and are used with the Merced College classes CPSC-05a and CPSC-01. If the students pass the 2 exams for these 2 seperate classes at Merced College the student would receive credit for taking these classes at Merced College. 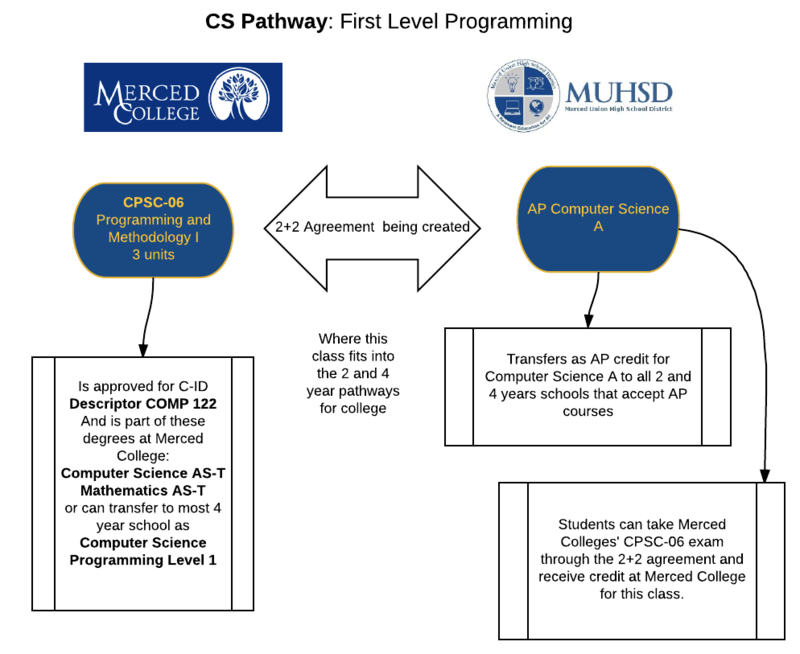 * The Student Learning Outcomes of the AP Computer Science Principles Exam and the 2 Merced College classes CPSC-05a and CPSC-01 are the same. Therefore, the exams and required artifacts are very similiar and the student could turn in the same artifacts for both AP exam and the CPSC-05a and CPSC-01 exams. * This is a Future Plan, this class is being articulated this 2017-2018 school year. * Note that the High School students will take 2 exams at the end of this class. The AP Computer Science A Exam, given as a regular AP Exam. The other exam is created and used with the Merced College classes CPSC-06. If the students pass the exam for this class at Merced College the student would receive credit for taking this class at Merced College. 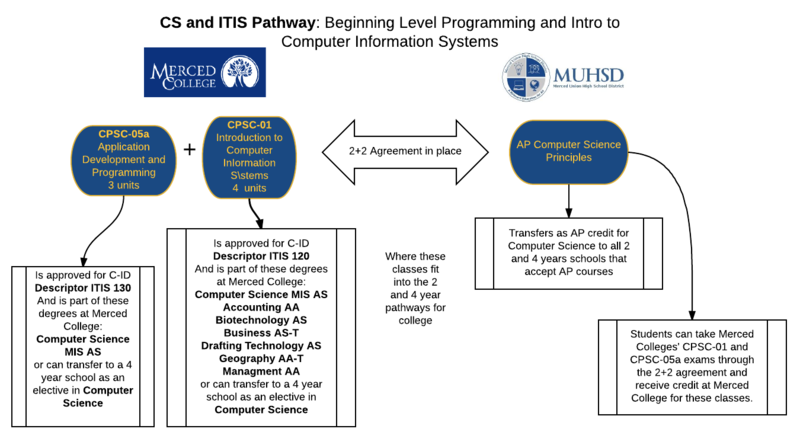 * The Student Learning Outcomes of the AP Computer Science A Exam and the Merced College class CPSC-06 are the same. The SSTEM Scholarship is for incoming freshmen to Stanislaus State that are studying CS, and Merced College CS Majors transferring to Stanislaus State. It is an awesome scholarship that is assiting our students in being successful! 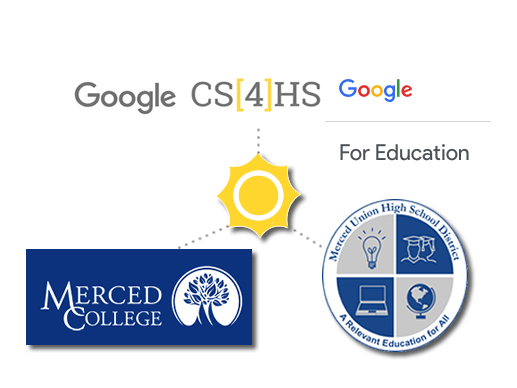 High School students and Merced College students both entered awesome STEM projects. High School students and Merced College students entered the fair that was held April 7th - check out the winners! 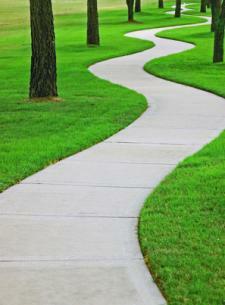 All content and views in this website are not necessarily those of Merced College.